Music collective Tracks organised an all-day event to put women in music in the spotlight at the magnificent new Theatre Hullabaloo. A songwriting workshop and a panel discussion with women in the North East music industry was a celebration, an inspiration and a route map for the road forward. It was also a prelude to a special evening with talented female performers from the region. Unfortunately headliners The Van T’s had been snow bound in Glasgow, so gamely stepping in to open the evening was a very talented replacement in Zarahruth. The set featured a recent BBC Tees Introducing Track of the Week, Oh Love, the sensitive lyrics leapt out when stripped back to vocals and acoustic guitar. Leddie MC debuted as a solo hip-hop artist with one of the most exceptional albums of last year, Piece of Cake. It was a real thrill to witness live renditions of some of those incredible lyrics. She can be biting when she has you in her cross fire; razor sharp and a wonderful wordsmith. One of the outstanding acts at October’s Twisterella Festival in Middlesbrough, Eve Conway was revelling on being on home turf. Her rendition of Invitation has real power and authority, but when she lays down the guitar and loops and layers her vocals Eve seems to plug into something primeval and utterly memorable. Twist Helix soon had everyone up out of their comfortable theatre chairs and on the dancefloor. 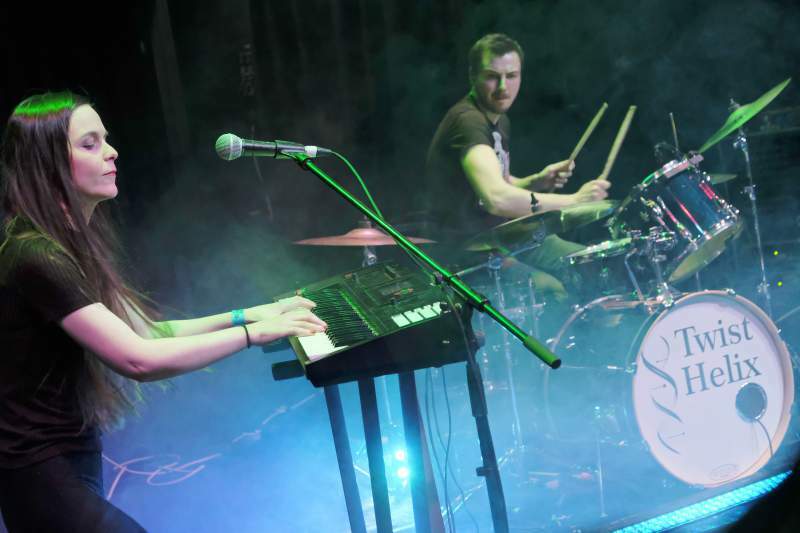 Truly a dynamic duo, their energising electronic alt. pop combines scintillating synths, soaring vocals and driving beats from the odd-one-out male drummer. An epic climax to an essential event and further proof that female talent is on the rise in the North East.